I’m an aerospace software and systems engineer, working most recently at NASA’s Jet Propulsion Lab and Boeing’s Phantom Works. I am now retired and spend much of each day writing, mostly fiction. I am also one of many diverse professionals who study, think, and discuss how to colonize the Moon. Here are some ideas your own engineers may not have suggested to you. BUILD WITH TELEROBOTS – Drones remotely operated from Earth are most cost effective. “Deaths” among them are not tragic, they need no air or water or food or habitats, they need not be returned home. BUILD WITH PREFABBED PARTS – Construction on the Moon can be done faster and better by doing the hardest work here on Earth. USE LOCAL MATERIALS – Lunar rocks and soil contain useful minerals which can be extracted in several ways. These include oxygen and the metals iron, calcium, aluminum, and magnesium. USE VR/AR HEADSETS – “Vears” are an infant industry slowly ramping up to a big business. Remote operation of drones and viewing of the Moon by long-distance “tourists” is a way to give Earth-bound humans a better way of visiting the Moon. Putting people on the Moon is a practical near-term goal. Putting them on Mars is not. 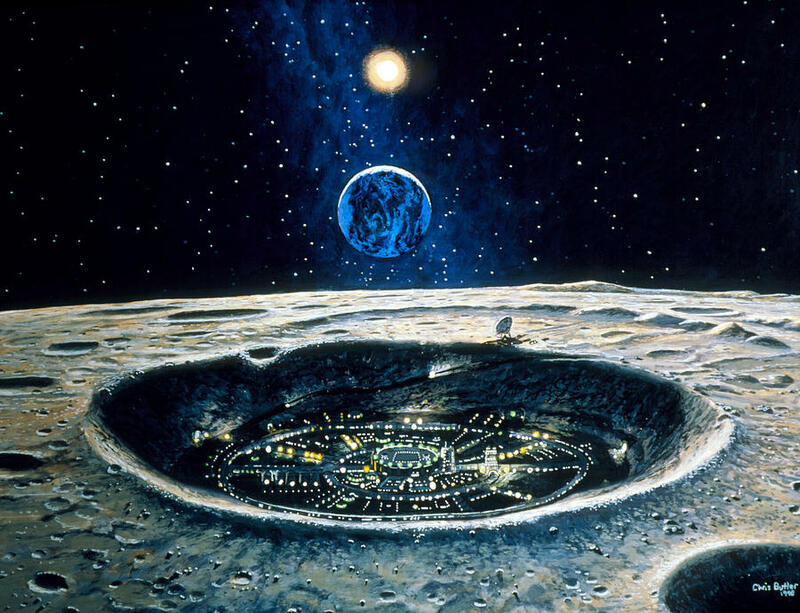 It’s time to build a moon base, or better a moon city. After the base or city is built it would be covered by a thin layer of dirt to protect it from meteorites and extremes of heat and cold. Artwork by Chris Butler, available in several different versions at his web site. This entry was posted in Announcement and tagged Luna City, Lunar colony, Moon base, Moon colony, The Eons-Lost Orphan, the Moon. Bookmark the permalink. Just looking for the second orphan book you said should be out in January? Hi, Tim. Thanks for the inquiry. I certainly hoped for January, but the sequel is presenting difficulties I did not have with Orphan 1. That book flowed constantly in an almost 24/7 way onto the virtual page and was done in five weeks. Orphan 2 is coming a few hours at a time. Each book, I’ve found, has its own stubborn momentum on its way into this universe. Trying to hurry its progress only slows it. One was a hare; Two is more like the tortoise. But like the tortoise its way is in the long run steady. I’ve said elsewhere recently that I just passed the 65,000 word milestone on the way to (I’m guessing) 100,000 words. Hang in there. Don’t hesitate to ask again what’s happening. Readers own a book almost as much as the author. Your questions encourage me.